Please help to create color toolbar. Details are here. and compare the output with the SHA256 above. 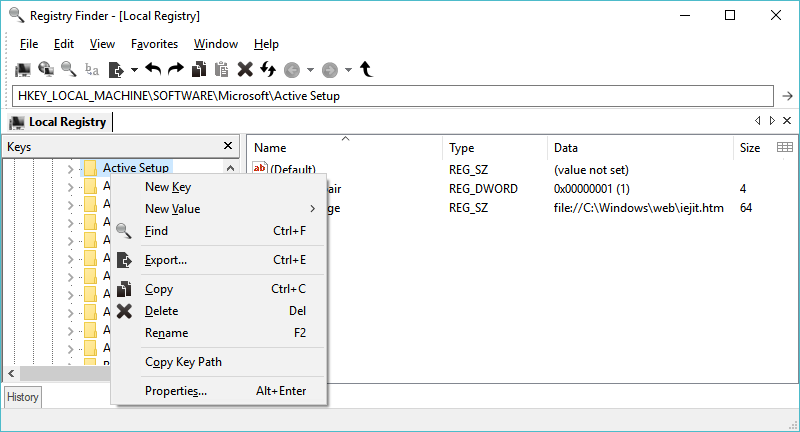 To facilitate importing .reg files with Registry Finder you can add a command to Windows Explorer's context menu for .reg files. To do so, just execute the ContextMenu-Add.bat file. To remove the command, execute the ContextMenu-Remove.bat file. Also, you can make Registry Finder, instead of regedit, to perform import when you double-click a .reg file: execute RegFileAssoc-Add.bat. RegFileAssoc-Remove.bat restores import with regedit. Note. You must execute files with administrator rights, otherwise you'll get the Access denied error. --computerName arg Specifies the name or IP address of a computer to connect to. --navigate arg Specifies a registry key to navigate to. If this parameter is set to "clipboard" then the path is taken from the clipboard. --reopenLocal arg Restore or not previously opened local registry windows when Registry Finder starts (arg: true or false, default is true). --reopenRemote arg Restore or not previously opened remote registry windows (arg: true or false, default is true). --dataFolder arg Specifies folder to store settings and undo history. --import arg Imports the specified .reg file into the registry. The work is always performed in a separate instance (that is the --multiInst is implied). --importSilent Do not display a confirmation of import. --multiInst When an instance of Registry Finder is already running, starts a new instance. By default, the running instance is activated instead of starting another one. Note 1. The parameter names are case insensitive. Note. HKEY_CLASSES_ROOT is a special case. 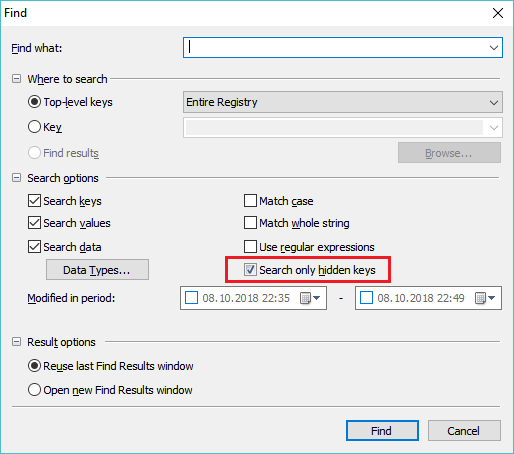 Registry Finder correctly finds hidden keys in HKEY_CLASSES_ROOT, but it does not go inside them. If you need to look deeper, you have to search at least in HKEY_CURRENT_USER\Software\Classes plus HKEY_LOCAL_MACHINE\SOFTWARE\Classes. Available translations are listed here. That creates RegistryFinder_lang.ini file containing all strings used in Registry Finder UI. Open the created language ini file in Notepad or in any other text editor. Translate all string entries to the desired language and save the file. This information is shown in the About box. Start Registry Finder. It automatically invokes MakeLang with the -d parameter to create the RegistryFinder_lang.dll file containing all translated resources in binary form. If you want to run Registry Finder without the translation, rename the language ini and dll files, or move it to another folder. Here you can find some clarifications to certain lines in the language file. If you translate Registry Finder into you language, please send me the language ini file and I will share it with other people. An icon set from Martin. For portable mode, the program's folder. For normal installation mode, %APPDATA%\RegistryFinder. For details on how to create custom toolbar icons, see here. When Registry Finder encounters an unexpected error it generates crash report and asks you to send it to the developer. This report contains information essential to investigate and fix the problem. So please prefer pressing the Send report button. If you encounter crash multiple times, do not hesitate to send report two or three times - it is possible, the latter contain slightly different information not available in the former. 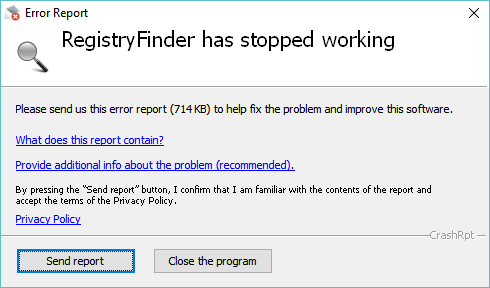 Press the Close the program button when you believe you already reported the same problem several times. Please note that due to lack of time, I analyze reports from the latest version only. In brief, this utility is released as freeware. You are allowed to freely distribute this utility via removable media, Internet, or in any other way, as long as you don't charge anything for this. For details, please see License Agreement. Software listing web sites that support PAD files can use this file to automatically update the product information when new version of Registry Finder is released. For more information about pad files, click here. If you have any problem, suggestion, comment, or you found a bug in Registry Finder, please send a message to feedback@registry-finder.com or create a topic at GoogleGroup forum. Registry Finder will be developed further, so your feedback is greatly appreciated!